There I was in the boat, heart thumping, hearing the countdown from the coach on the bank 20, 19, 18…., and then a command from the boatmen, “bow pair take a stroke!” to push the boat slightly ahead and before I knew it, 2..1.. “BANG” the cannon went off and there it was my first bump starts (think of a 100m sprint start but sitting in a boat). The adrenaline rush gave us a strong start and after two minutes, my lungs were screaming and I was hoping the race would end soon. We were gaining on the crew in front of us (St Catherine), whilst set a decent length away from Homerton, the crew chasing us! 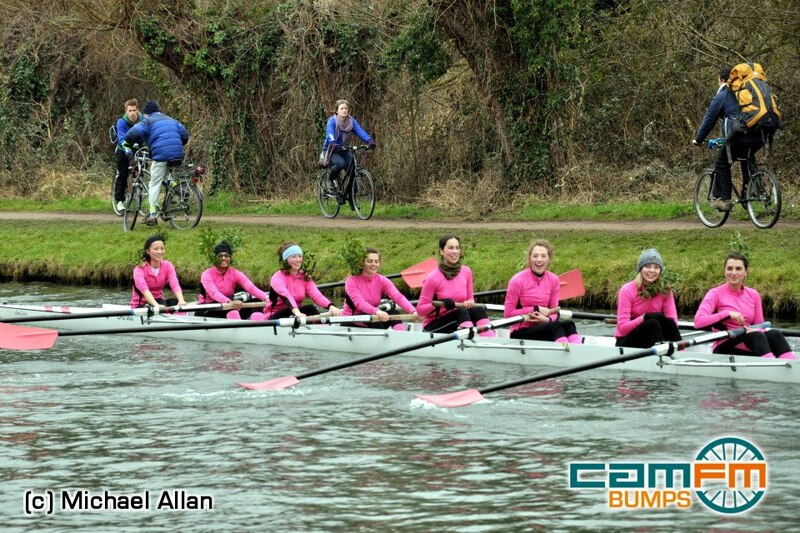 We “bumped” St Catz in no time and it was sweet victory for Churchill W2 on the first day of bumps. Bumps is a competition that is unique to Cambridge, where boats are lined a boat length and a half apart from each other. The objective of the race to is to catch up with the boat in front of you whilst making sure you are not caught from the boat chasing you. The bumps started in the early 19th century, where the banks of the river cam were lined with reeds. So students of the time developed a game of hiding in the reeds , in a simple rowing boat until another boat passed. A hunting horn would then be blown by way of a challenge, and the concealed boat would attempt to catch the challenged craft before reaching the next bend. These student antics were eventually formalised and the Bumps were devised in 1827. I have included several links below to give you a better history and understanding of the competition. Lent bumps runs over four days and you need to bump each day in order to win the coveted oar which graces most college buttery walls, and sadly for Churchill W2 the following two days, were a test of strength in every sense of the word for our crew. We always started out strong, and on both occasions within “bumping” distance of the crew ahead of us, but as a novice crew rowing at a high rate (42…40 and 39), our technique was not as refined and unfortunately, some of our crew members caught a “crab” – (a term used to define when the oar flips parallel to the boat) …and with that crashing out and our hopes of winning a blade. What was amazing was we stuck together as a crew, learnt from our experiences and in the final day, pulled a strong row and bumped Kings Women’s 2nd boat (W2) denying them of their blade victory! Watch us! It was a good finish to the competition knowing that we are a strong crew with great potential and having the problem of slowing the rate is perhaps better than being told you need to row faster! At least all the early morning practices in the freezing rain and snow were worthwhile! Oh yes not to mention the cross fit training carried out by our very own MBA trainers Derrick Q and Dave J. #Awesome guys! The Cambridge MBA cohort came out to support us by the bank side and of course the cheering made us feel like celebrities as we rowed past them….